Rjurik Davidson is a fellow graduate of Clarion South 2005 and a man of many talents. He is an associate editor of Overland (an Australian literary journal), an award-winning author of short stories, essays, screenplays and reviews. He also has a PhD in Science Fiction and American Politics, and has taught at a number of universities. And most importantly of all, he is a helluva nice bloke. 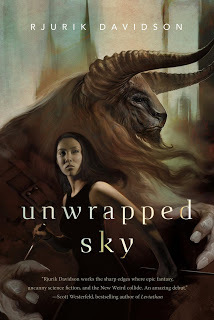 Rjurik takes some time out of his writing schedule to talk about his latest book, Unwrapped Sky. Plus you can admire his stunning covers! Nathan: People are always interested in hearing how authors achieved the publication of their first novel. Can you share your journey to print with us? Rjurik: It was a much longer journey than I anticipated. Some was to do with me, some was to do with things outside my control. To begin with, writing when you have a day job, and a life, can be hard. For a long time I had trouble finding the time. But that’s not something unique to me; every writer has had to deal with that issue. As I was writing Unwrapped Sky, I had a number of stories published, and that made a big difference to my profile. Shorts don’t bring in much money, but they can help people know your name and your style. The novel was contracted in 2010 and other things intervened – some I’ll only talk about over a drink – and so it’s been four years since the first draft was done. So it feels like I wrote Unwrapped Sky a long time ago. It’s finally out this month, which is exciting and terrifying too. Nathan: To the uninitiated, how would you describe Unwrapped Sky? Rjurik: Unwrapped Sky sits somewhere between fantasy and science fiction, in a little subgenre sometimes called the New Weird. It’s set in the fantastic city of Caeli-Amur, which is something like an industrial version of Ancient Rome. Steam trams chug along the streets. A ruined forum lies close to a huge arena. Three dictatorial Houses rule the city. It’s filled with strange wonders. Ancient Minotaurs arrive for the traditional Festival of the Sun and New-Men bring wondrous technology from their homeland. Hideously disfigured Wastelanders stream into the city and strikes break out in the factory district. Nathan: Apart from seeing your books on a shelf, what is the most satisfying part of being published? Rjurik: Fulfilling your dreams. Like most writers, I’ve spent countless hours working to make it happen, imagining what it might be like, hoping it will come off. So there’s a great sense of achievement, and childhood Rjurik can rest a little easier now. It’s a bit of a weight off too, especially as (at least some) people seem to like it. Of course, now there are other challenges. I’d like to establish myself as a full-time writer, who writes mostly fiction. I’ve managed to get there for this year, but it’s taken a lot of work. Will I be able to continue to do it? I’m not sure, but I’ll try. Nathan: The city of Caeli-Amur is a memorable creation. Can you give us an insight into your approach to creating such a wonderful city? 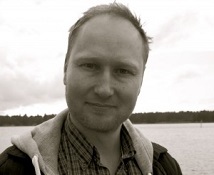 Rjurik: World building is mostly a matter of merging or combining things that interest you. I love Ancient Rome and Greece and I have spent a lot of time traipsing around various archaeological sites. I just came back from Turkey, where I got to see a whole bunch more. I’m also fascinated by the fifty years spanning somewhere between 1890 and 1940, when the old order (Europe especially) was being broken apart and new social forces (industrialism, technological revolutions) and cultural movements (the avant-garde) were emerging. So those two elements are important factors in the creation of the city. A story like ‘Nightime in Caeli-Amur’ (available at http://www.tor.com/stories/2014/01/nighttime-in-caeli-amur-rjurik-davidson) shows a bit of both these elements, but the narrative is a little bit like one of Chekov’s short stories, or perhaps one of the other Russians. Then there’s also another factor which I added in: the world where Caeli-Amur is set had suffered a great cataclysm a thousand years earlier, in which a kind of utopia had fallen, and so there are ancient technologies strewn about the place which hardly anyone knows how to work. It gives the world a weird science fictional element to it. Nathan: What is the next project you are working on? Rjurik: At the moment, I’m writing a steampunk novel set in an Alternate Australia. Here’s a fragment from the synopsis: “In Melbourne’s Museum, a wonderful exhibit of new technologies arrives, filled with splendorous mechanisms, including automatons of all kinds of creatures. When the central exhibit of the exhibition, the “clockwork man” goes missing, librarian and strong-willed suffragette Eugenie (Gene) Healy is asked by the burned out detective, John Lynch to help him with the investigation. The trail leads them to opium dealers and spiritualists, industrialists in the halls of a powerful men’s club, to a rural utopian community who have rejected the modern technologies, and into the hideout of one of the last bushrangers. They encounter the remnants of the megafauna such as marsupial lions that roam the forests and giant lizards that laze languorously by billabongs. In the desert, they find a secret, hidden for millennia which will change things forever.